Are you planning to conduct research on Black Friday sales and discounts? 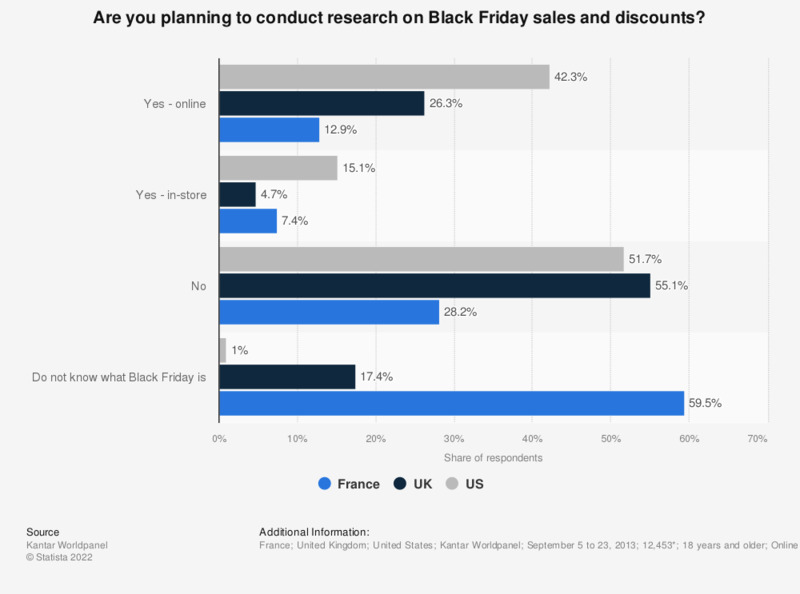 This statistic shows a comparison of UK, U.S. and French consumers planning to conduct research for Black Friday sales and discounts in 2014. Black Friday traditionally takes place in the United States on the Friday following Thanksgiving, marking the start of the Christmas holiday shopping period with major retailers usually offering promotional discounts. The vast majority of U.S. respondents had heard of Black Friday compared to less than half in France. Of UK respondents, just over half said they did not plan to search for Black Friday deals. Of those who did, the majority stated they would be doing so online rather than in-store. Which device do you use to look for Black Friday deals online? Do you think you will shop during the Black Friday weekend? How much do you plan to spend during the Black Friday weekend? Did you look for online deals on Black Friday? How many stores do you plan to go to on Thanksgiving and/or Black Friday? What time do you plan to begin your shopping in a physical store on Thanksgiving and Black Friday?